Stress signals induced by viral infection lead to arrest of translation in order to inhibit viral replication. Among the main actors of this pathway, the host PKR is activated by dsRNA, dimerizes, autophosphorylates and then phosphorylates the eIF2-alpha translation initiation factor. eIF2 alpha phosphorylation results in arrest of translation of both cellular and viral mRNAs. Viruses have evolved different strategies to avoid complete arrest of cellular and viral translation. 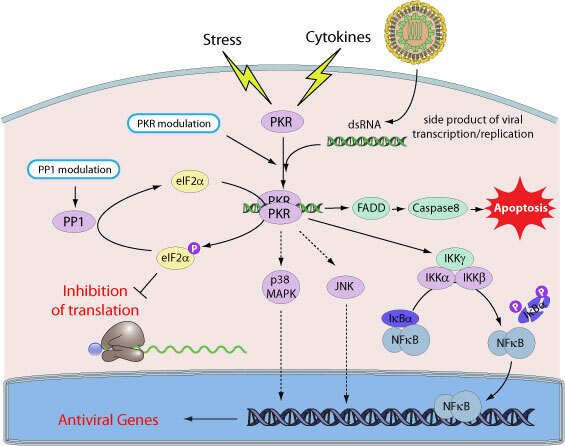 Many of them directly modulate PKR activity while others inhibit phosphorylation of eIF2-alpha by different mechanisms such as modulation of host PP1, a phosphatase able to directly dephosphorylate the translation factor eIF2-alpha.